Part of our human nature is to mark the milestones in our relationships. We like to feel our relationship is moving forward and developing and one of the ways we do this is to give a symbolic gift to our partner to celebrate the year gone by. Find below your anniversary gemstone or precious metal. Shop with us and your purchase will be lovingly wrapped and delivered free anywhere in the UK and to your partner's address if required. Our gold plated gemstone jewellery is ideal for your first anniversary together. Made in Italy, this stunning jewellery combines wonderful colour combinations brought together with gold plated sterling silver. 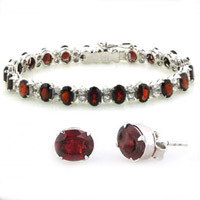 The warm glow of deep red garnets is perfectly offset by sterling silver. Garnets have been worn for centuries and have earned their place as a favourite semi-precious gemstone. 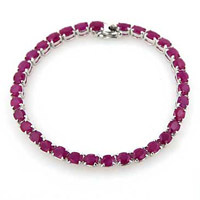 Our garnet jewellery features rhodolite garnets although there are many other types. Cultured pearls, fresh water pearls or synthetic pearls will cater for all budgets. 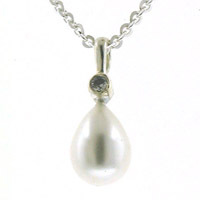 Pearls are available in many colours the most popular being white, ivory, pink, grey and black. The colours of the blue topaz gemstone suit everyone. 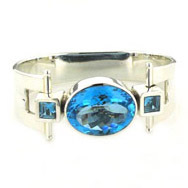 The particularly striking colour of swiss blue topaz is a favourite and looks perfect set in sterling silver. Our blue topaz jewellery collection is large and has something for everyone. The best known and traditional sapphire colour is deep blue. 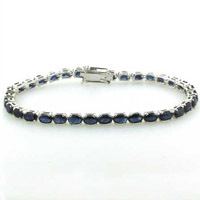 However, sapphires are available in many colours. Celebrate your fifth anniversary with golds, greens or amber sapphires. 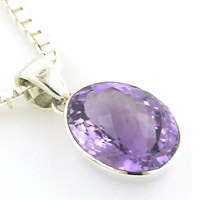 Amethyst jewellery is amongst the most popular gemstone jewellery. Traditional amethyst is purple but available in all shades from pale lavender to deep regal purple. If purples aren't your colour, look at the beautiful green amethyst jewellery. Opaque and colourful, onyx is a perfect gem for jewellery whether faceted or polished. We offer red, green and black onyx jewellery all set into sterling silver. A beautiful gift for an anniversary! 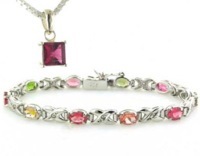 Tourmaline's wonderful cornucopia of colours makes it an ideal choice for jewellery. Available in all colours, it's the pinks and greens that are most popular. Once worn to express friendship, once used to create ultramarine colour for painting and always loved for its versatility, lapis lazuli is a time worn favourite. Perfect for everyday wear lapis lazuli jewellery dresses up or down to suit formal or casual occasions. 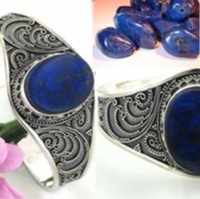 Our lapis lazuli silver jewellery collection is large and has pieces suitable for both women and men. It's many shades, it's unique veining and its characteristics linked to its progeny make turquoise a very special individual gemstone. 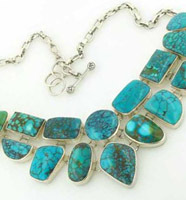 Turquoise is mined in many areas around the world including Tibet, Nepal, Arizona and Iraq. Each region produces very different colours and veining matrix. 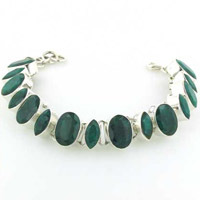 Jadeite or nephrite are known as jade which comes primarily from the east. 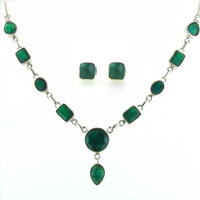 It is cherished for its green colours which vary from emerald to a blue green verging on turquoise. Jade is often carved into ornaments. 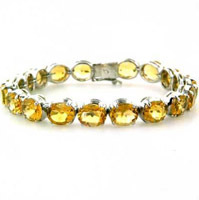 Citrine silver jewellery is not readily available. Citrines vary in colour from pale straw to deep cognac and the deeper end of the colour spectrum is the most sought after. Brandy citrines as they are sometimes referred to are very richly coloured. 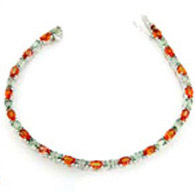 Good quality citrines are eye clear, brilliant, even in colour and can be large gemstones. Beautiful to wear! Opal is the spangler of semi-precious gemstones. The surface shimmers with all the rainbow colours against a milky background. Mined in Australia, opals are usually set into gold. 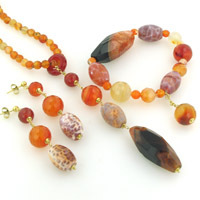 They are fragile stones and need to be worn and stored with care. After 15 years together, a piece of ruby jewellery is what's required! 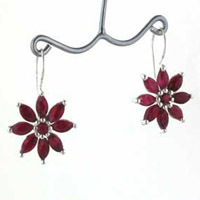 Ruby is one of the well known precious gemstones and has a gorgeous crimson red colour. Rubies vary greatly in quality and price. A flawless ruby of size will set you back a considerable sum but there are lower grades and lower price tags that are still beautiful gemstones. This special semi-precious gemstone has a wonderful fresh green colour. 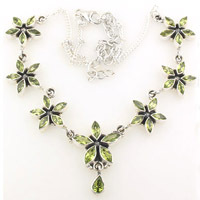 We offer the largest collection of silver peridot jewellery in the UK so enjoy choosing that special piece! One of the more precious of the semi-precious stones, aquamarine is the same mineral as emerald - beryl. 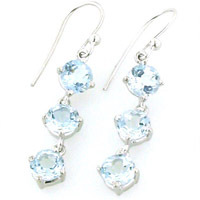 As its name implies, aquamarine is a pastel aqua colour sometimes more green sometimes more blue. This revered precious stone has been used to adorn royalty as well as the fingers of loved ones. Flawless emeralds are relatively rare and many people like an inclusion to prove the stone's authenticity. Emerald has given its name to a particular shade of green. 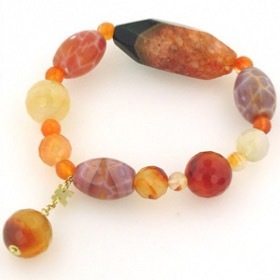 Not readily available on the High Street, iolite is a little known semi-precious stone. Sometimes mistaken for tanzanite, iolite is an indigo shade of blue. 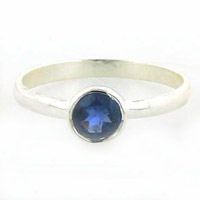 Depending on the way the gemstone is cut, iolite can be pale or deep blue. At this milestone, your gift to your partner needs to be silver. 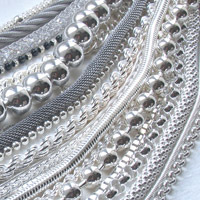 Whether it's a plain sterling silver necklace, a silver bracelet or a piece of gemstone jewellery set in silver, we can cater for your needs. Thirty five years and still together. This achievement deserves something special! After 40 years together you are well into the precious gemstones area. Blue isn't the only colour! All things golden to mark this impressive milestone. You have reached the zenith and have been together for 60 years. This immense achievement is to be celebrated with diamonds!